Starring Brie Larson, Captain Marvel hits cinemas this weekend. OFF-SCREEN, WE’RE surrounded by female superheroes. Serena Williams scooped her 23rd Grand Slam while she was eight weeks pregnant. Simone Biles became a world champion gymnast at 16. Katie Taylor has landed 18 Olympic gold medals. Last month, Nike has declared 2019 its year of women with this awe-inspiring Dream Crazier campaign. And with its latest release, Marvel Studios aims to do the exact same. Captain Marvel will see the studio’s first ever female superhero come to life on-screen. Its star Brie Larson is a force to be reckoned with even when she’s not in costume. Larson signed her contract for Captain Marvel the year she won an Oscar for Room. According to Boston Herald, the next nine months were filled with intense physical training which included judo, boxing, wrestling and visits to an Air Force base. I can say that I am really strong. I was able to deadlift 225 pounds, to hip-thrust 400 pounds. To push my trainer’s 5,000 pound Jeep up a hill for 60 seconds. So, don’t for a second expect any less action from this superhero: “When it comes to what a female body is capable of, it’s capable of a lot you know.” In fact, Larson did most of her own stunts in the movie. In the first solo superhero movie in the Marvel universe, Larson plays Carol Danvers. Originally introduced in 1968, Danvers has super-strength and the ability to fly due to a freak accident. According to Vox, the character already has a dedicated, passionate fandom who are hoping to learn her origin story. 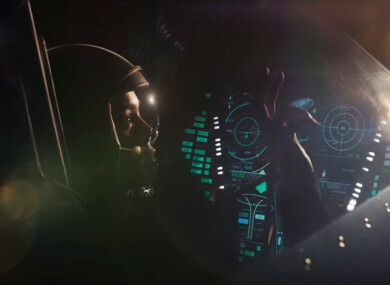 Captain Marvel begins following a serious accident and the former US Air Force fighter pilot is now a member of an elite Kree military team called Starforce. When a centuries-old galactic war breaks out between the Krees and the Skrulls, Danvers descends to Earth to save the universe. Samuel L Jackson and Jude Law also star. The pre-release ad campaign already has critics buzzing. According to CBR, a chain of fake video rental stores called Stanley’s Video have popped up across the US. Its walls are populated with empty DVD cases and following a treasure hunt of six clues, visitors can win a Captain Marvel logo badge. The film is expected to have one of the strongest Marvel Universe openings to date – predicted to take in $160 million (€141 million) in the opening weekend alone. It will also be the first film following Stan Lee’s death in November last year and the film is thought to feature a heartbreaking tribute to the comic book legend. It was something that came from Marvel and when they showed it to us, there was not a dry eye in the house. It was really emotional. With so much trailblazing in one film, it’s no surprise that the older fans of the Marvel series are adamant that the next generation gets to see this one. According to The Hill, a fundraiser to hold free Captain Marvel screenings for underprivileged girls has hit $60,000 (€53,000). If that figure is anything to go by, Captain Marvel is only the first chapter of incredible female superheroes we’ll get to see in action on the silver screen. Captain Marvel hits Irish cinemas this weekend on general release. Like to see Marvel Studio’s unique new film for yourself? You’re in luck – Captain Marvel hits Irish cinemas this weekend from Marvel Studios. Get a taste of what you can expect here or book tickets to see it in your local cinema here. Email “WATCH: Why Marvel Studio's first female superhero movie is set to pack a serious punch”. Feedback on “WATCH: Why Marvel Studio's first female superhero movie is set to pack a serious punch”.